Usually when someone says to me, "You have to be drunk or be high to appreciate such and such film," I usually think, "Gee, thanks for the pick-me-up. Can't wait to watch." Some such person told me to get drunk before I watched Hansel and Gretel Witch Hunters and I would 'appreciate the film' much more. Well, I gave up swilling boozebe a long time ago so I went in dreading the outcome; sober. Hansel and Gretel Witch Hunters is camp and cheese that Roger Corman would be proud of. It's tag line is,"Classic Tale. New Twist." got it? Ooooookay. This classic re-spin stars Jeremy Renner and Gemma Arterton as Hansel and Gretel who have taken up ridding the world of witches after their own near death experience with a witch when they were kids. Now as adults they travel around the land chopping, slicing, dicing, burning, hacking, and disposing of witches with whatever means is available. I say they travel the land but they end up at Auberg (near their home!) which is now in ruins. How you travel all over and conveniently end up near your home without recognizing the terrain, AT ALL is beyond me, but okay, whatever. When they are told that the town has had 11 children kidnapped by witches, Hansel and Gretel begin to investigate and find that a ritual that will make all witches impervious to fire and/or burning is coming up in a few days. The BLOOD MOON ritual is what its called, the witches need 12 children and time is running out. Getting the drift? Hansel and Gretel Witch Hunters has some good things going for it. Jeremy Renner and Gemma Arterton are two. They seem to know they are in a dog of a movie but the movie makes good use of their talents as they drop the F-bomb and witches simultaneously. Most of the film is goofy but Norwegian writer and director Tommy Wirkola (Dead Snow / 2009) is not interested in substance but style. Hansel and Gretel deploy various gadgets to combat the witches but the most difficult witch to kill is Muriel played by Famke Janssen. She seems to know the two hunters from their childhood. How? They killed the witch that tried to kill them. It does not matter. If you are looking for reason, look elsewhere. Never mind the fact that, if my children story lore serves me correctly, weren't Hansel and Gretel of German descent? Yet, the only one that even comes CLOSE to a German accent is the local sadistic sheriff played by the always reliable Peter Stormare. There is a subplot involving a good witch and Hansel that I wished they had spent more time on. Which brings me back to Renner and Arterton. They are attractive leads and they have good chemistry and the film relies HEAVILY on their chemistry. I was particularly impressed at how damn attractive Ms. Arterton is in a pair of leather pants and sporting a crossbow. She has dropped her thick British accent because it apparently was easier for her to adopt an American accent than it was to have Renner adopt a British accent. Hansel and Gretel Witch Hunters has more in common with a better film, Van Helsing from 2004 with Hugh Jackman that EVERYBODY seemed to hate, but I liked it. Hansel and Gretel Witch Hunters is total cheese and stupidity on a grand scale, but it is not without its charms. Most of the characters....awww scratch that.....ALL of the characters talk like they are from Sacramento not Europe and it is clear everyone is in on this joke. This film is acted well enough and there is some undeniable fun action sequences and Alti Orvarsson's (an Icelandic composer) score is a good one. He has a mostly orchestral score that compliments the action succinctly, with some electronics and synthesized percussion for the close quarters combat scenes. This is not exactly a good film but it kind of won me over, in spots. Would I recommend Hansel and Gretel Witch Hunters? Meh, depends on your mood. If you are still sober and just want to settle in for some popcorn and cheese then Hansel and Gretel Witch Hunters is for you; sober or not. There are two versions of Hansel and Gretel Witch Hunters, an R rated version that runs 88 minutes and an unrated director's cut that is 98 minutes. I watched the unrated director's cut, but would wager there is very little difference between the two versions. When in doubt, ALWAYS go with the director's cut of almost any film. 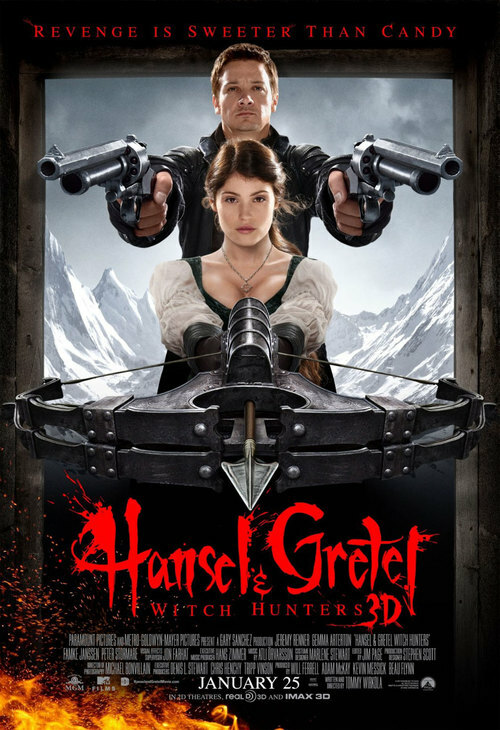 Hansel and Gretel Witch Hunters-**1/2 out of 4.